« We’re back! Sort of…. Also known as The Salad That Kept Me From Starving Last Week. Sorry for the light posting here lately. Life has been overwhelming and crazy with the symphony season(s) winding down, commuting around Florida, commuting around Minnesota, and the return of the not so welcome internet hackers. There hasn’t been much time for anything else. Things like cooking real, sit down meals have just not been happening here so this Thai Quinoa Salad came at exactly the right time. My friend Kathy (who really should be related to me) sent me this recipe and it’s a winner on so many levels – great flavor, chock full of veggies, and makes a HUGE bowl for eating (in the car) all week long. If you’re new to cooking quinoa, there are a few things to know. 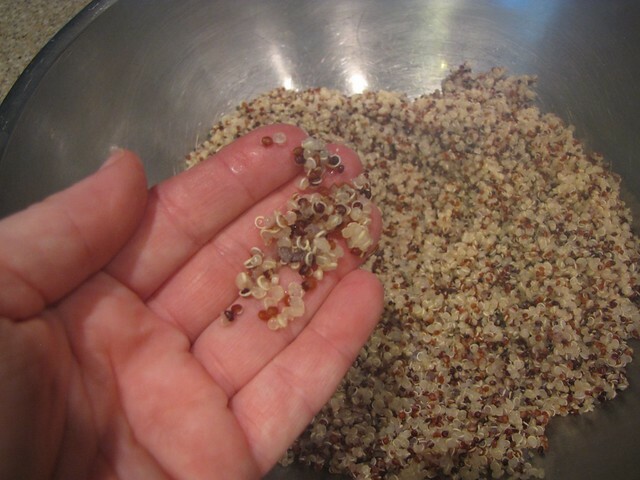 #1 – Always rinse your quinoa! This keeps it from tasting bitter. Just put the uncooked quinoa in a mesh strainer and give it a good rinse under cool water. 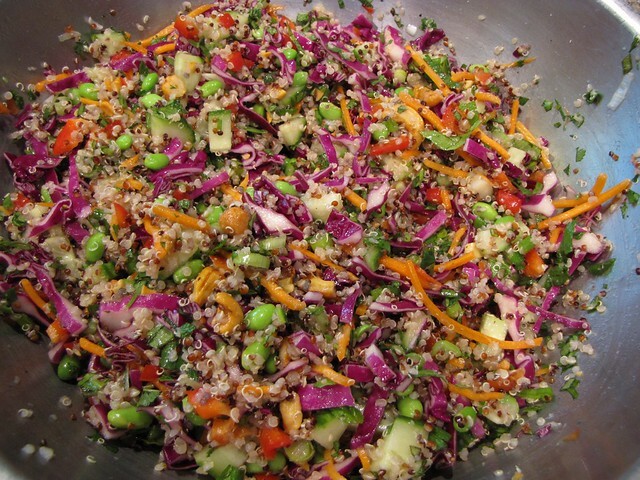 #2 – The ratio for cooking quinoa is the same as rice, 2:1 water to quinoa. So here I have a pot with 2 cups of water and 1 cup of my rinsed quinoa. By the way, I’m using Trader Joe’s Tricolored Quinoa but any color or brand of quinoa will do the trick. Bring the pot to a boil, then turn the heat down to low, cover with a lid and simmer until all of the water has been absorbed – about 10 – 12 minutes. 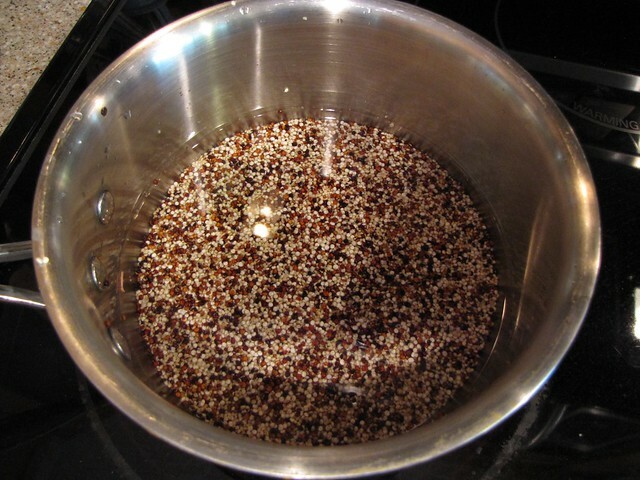 OR if you have a little more time, you can bring the pot to a boil then turn the heat OFF, cover with a lid and let the quinoa rest until all of the water has been absorbed. I use this method if I have a lot of running around to do so the quinoa can cook and cool while I’m gone or doing other things. You’ll know the quinoa is done when all the water has been absorbed and it has plumped up. You’ll see the little white split in the edges of the grains. That means it’s good to go. Allow the quinoa to cool completely…or if you’re in a hurry, put it in a bowl in the fridge while you prep your other ingredients. I have 1 English or hothouse cucumber that I have partially peeled. That’s just a personal preference…you can leave the peel on, cut it away completely, or make little stripes like I did. If you have a traditional cucumber, I recommend removing the seeds as they can be bitter. 1 red bell pepper, cut into small dice. If you like things spicy, add a chopped jalapeño or pepper of your choice into the mix! The only real technique here is just to be aware that you’re making a salad and cut your vegetables into fairly small dice so they fit easily on a fork. 3 green onions – I use the green and white parts. 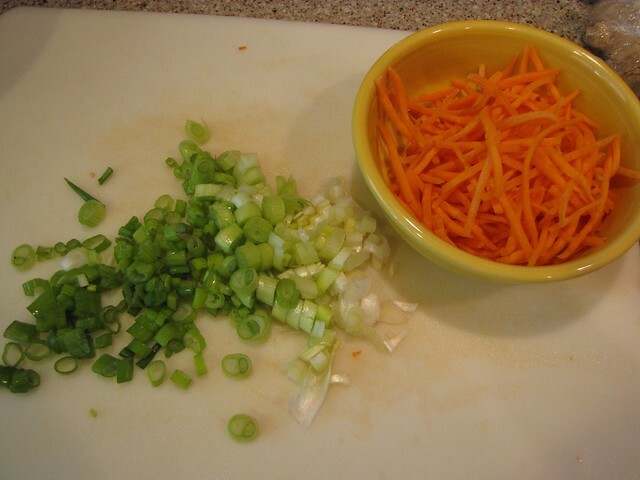 1 cup of carrots – I had matchstick pre-cut carrots but you can certainly cut or shred your own. 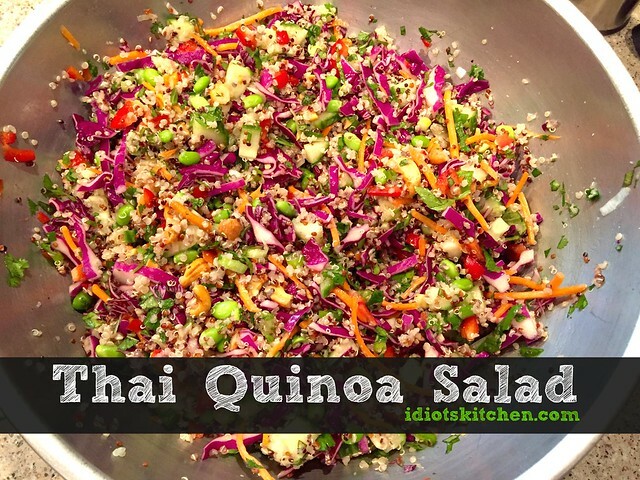 Cabbage gives Thai Quinoa Salad some heft and great color! 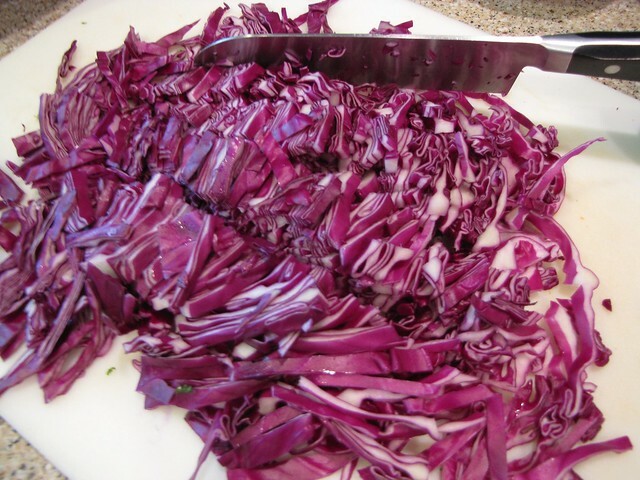 I’ve thinly sliced a little less than 1/2 of a head of red cabbage. After making the slices, run your knife through the other direction to get smaller, fork-friendly sized strips. You’ll want about 2-3 cups of cabbage total. 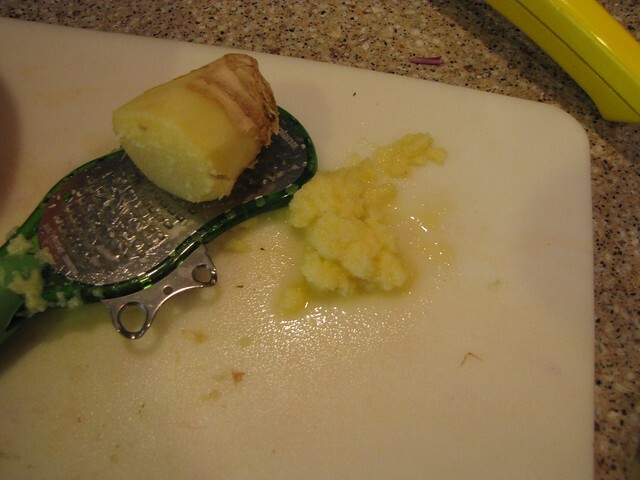 You can also shred the cabbage in a food processor or with a box grater. 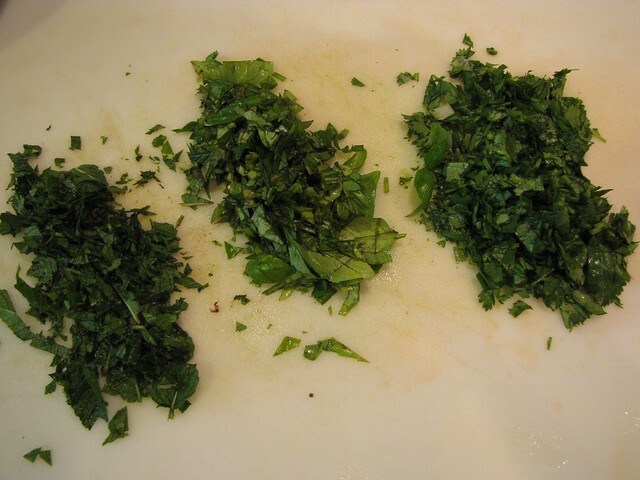 Fresh herbs – I have about 1/2 cup each chopped mint, basil, and cilantro. If you are a cilantro hater, substitute flat leaf parsley. Set the herbs aside to add LAST. One of my favorite things about this salad is the addition of edamame. These are green soy beans that I buy frozen in bags. You can find them shelled as I have here or still in the pod. I like to have both in my freezer – shelled for salads and pods for snacking. 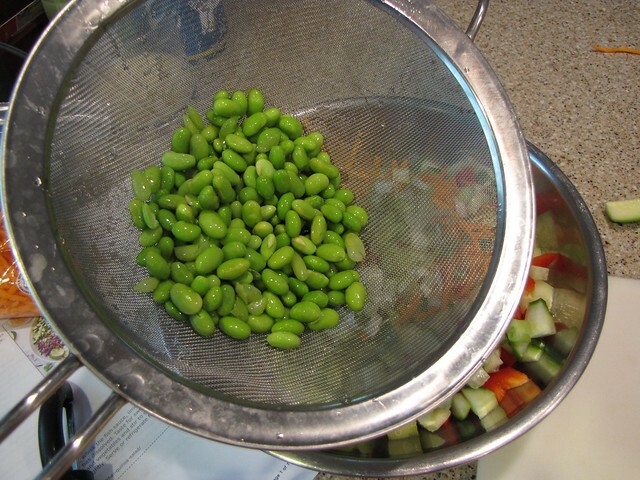 No need to really thaw these out, just give 1 cup of shelled edamame a quick rinse under cool water and add them to your bowl. So now we have a huge bowl full of quinoa and all the chopped veggies EXCEPT the herbs. Leave those for last so they don’t get all crushed and wilted. 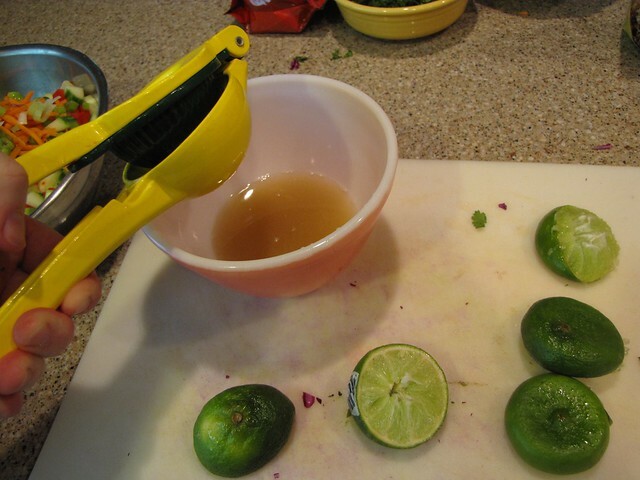 Make a simple Asian dressing by combining the juice of 3 limes with 4 teaspoons of Asian Fish Sauce. 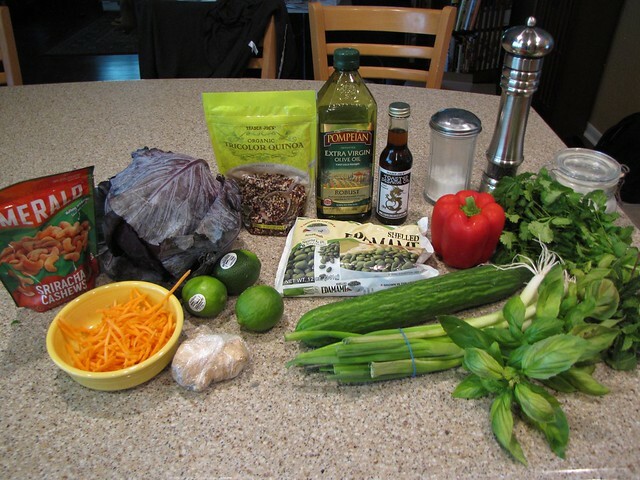 Sorry this didn’t make it into the ingredient pic, but fish sauce is sort of a secret ingredient and great to have on hand. 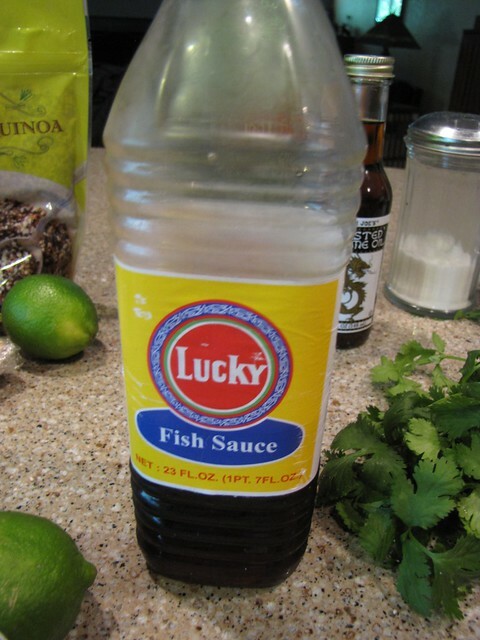 In spite of it’s name, it won’t make your dish taste fishy. Rather it adds what they call umami in Asian cooking – a savory taste that brings out the other flavors of the dish. Apparently umami is now considered one of the Five Tastes with sweetness, saltiness, bitterness, and sourness. Thanks google! Just don’t ever drop a bottle on your kitchen floor unless you want to have a cat convention. Learned that the hard way. 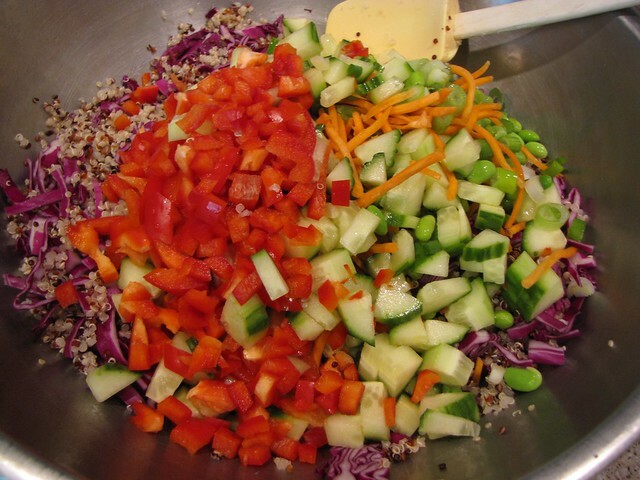 Whisk the dressing together until well combined and pour it over the salad. 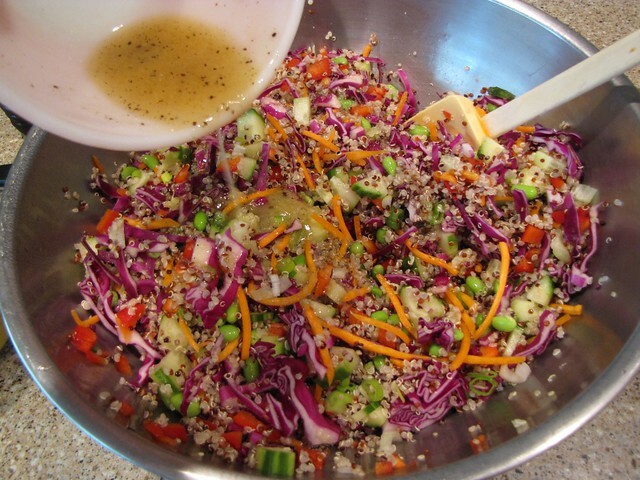 Toss it to thoroughly coat all of the quinoa and veggies in dressing. 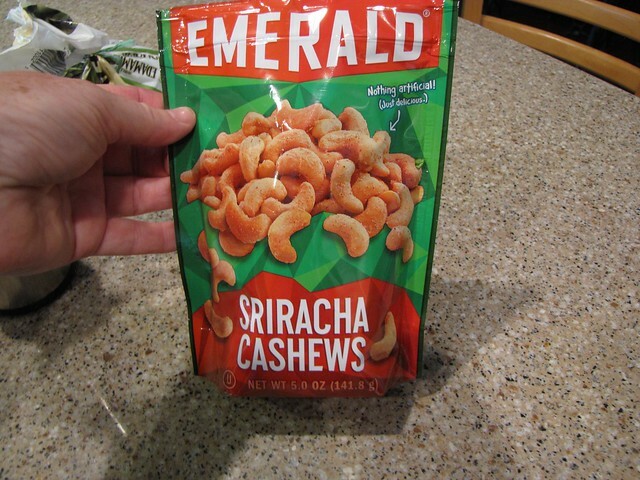 The original recipe called for peanuts which fit the Thai theme but I had these Sriracha Cashews which seemed like a REALLY good substitution. Have you tried these? We can’t open a bag of these in our house and expect to display any sort of self control. They’re so good. I chopped about 1/2 cup of these cashews and added them last with the fresh herbs. Give the salad a light toss to combine and you’re good to go! You can eat this right away or let the flavors develop in the fridge for a couple of hours. It makes a HUGE bowl – probably 8 servings but it keeps nicely for a few days in the fridge. 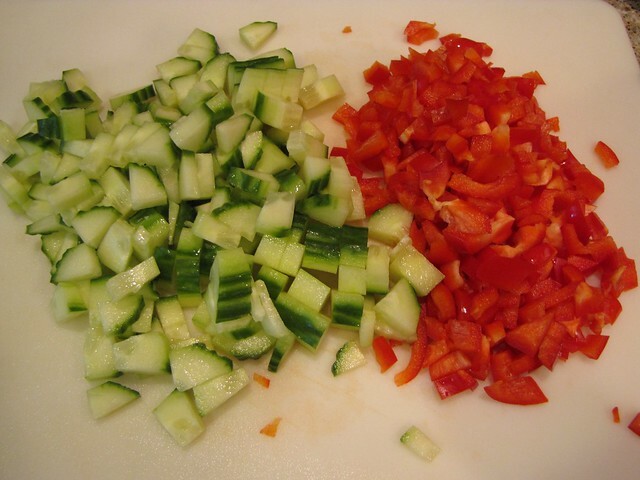 If 8 servings is daunting, simply cut the recipe in half for a more manageable amount. I like this just as a lunch or dinner salad. It’s GREAT for eating on the run because it doesn’t need refrigeration. It also makes a versatile side or salad for almost any grilled meat or fish and because it’s loaded up with veggies, you can feel good about eating your food fast rather than fast food.